My wife and I just took the NRA Home safety Course and are applying for a firearm permit. I have handled firearms before in the Marine Corps back in ’61 to ’65, however my wife has never been near a firearm before. When we get our permits we are going to get firearms. My wife wants to try some out on the range before hand so we would like to take you up on your kind offer. Please let me know when it would be convenient for you. This past Saturday we got together for some shooty goodness. 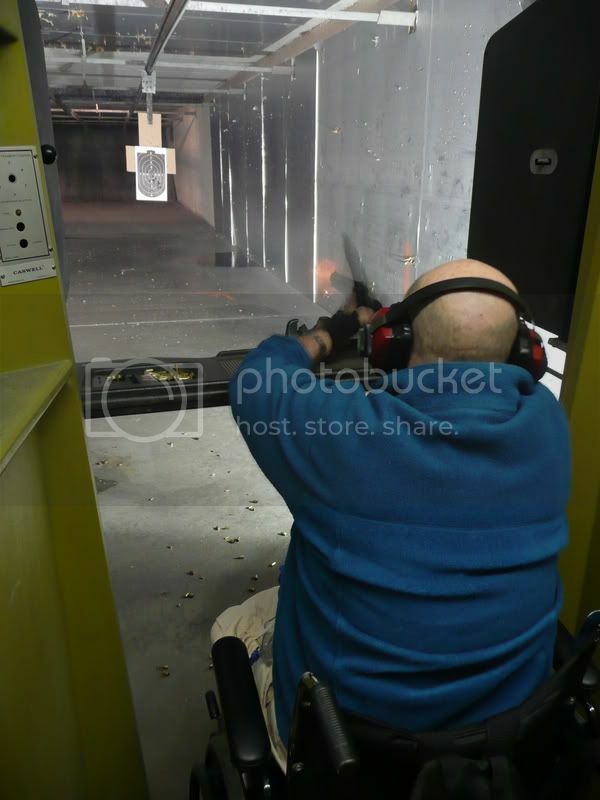 I met Jack and Mary Ann at the local public range - we would have met at my gun club except that: a) It's currently buried under about 2 feet of snow; and b) it'd be rather difficult getting Jack's wheelchair down the stairs to the basement range at the club. 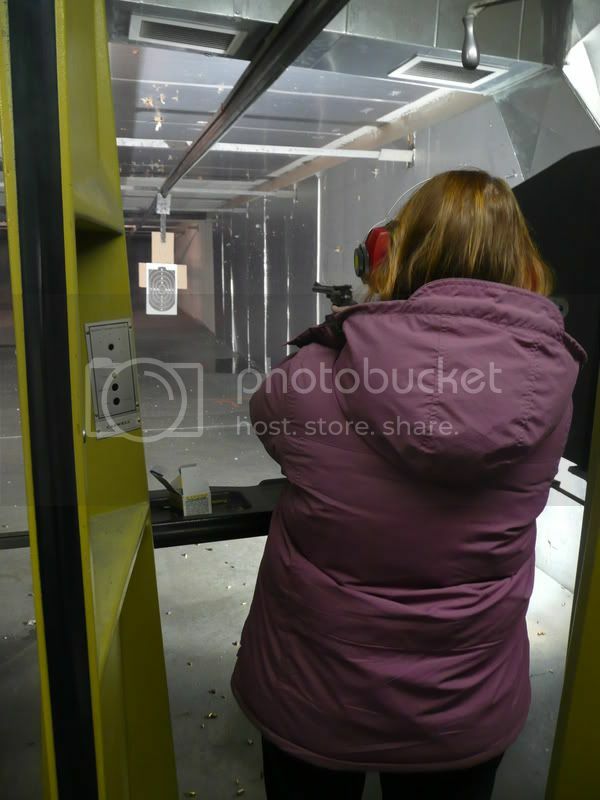 So we met at the local range, a place I've been going to for almost 20 years now. It's under new management, and they've made some improvements to the place. While we waited for a range to free up, I gave my quick safety spiel and made sure we were clear on general range etiquette and "what to do if" situations (jams, FTE, etc.). I had brought some snap caps for demonstration and gave a quick overview of the operation of both revolvers and semi-automatic pistols. As Jack's e-mail mentioned, they had both taken the NRA course, so most of this was simple review - but there's no such thing as too safe when it comes to introducing a new shooter IMHO. Colt 1991A1 for centerfire semi-automatic. Normally I'd have brought the SigSauer P226 for a centerfire semi-auto, but Jack requested a 1911-variant "for old time's sake" from his days in the Corps. Can't say I blame him. We're already making plans to get together again once the snow melts for some rifle shooting and some evil orange clay killing at the gun club. And for some reason, I suspect there will be a .357 Magnum wheelgun and a 1911-style semi-auto in their future once they get their permits. Baby Vulcan is shining his countenance upon you this morning. Well done, sir . . . well done. Is the public range the not so sooper sekrit place you and I visited on a couple of occasions? If so, the lanes look quite a bit better than before. As for Jack, being chair bound adds an extra dimension to needing better tools for self defense. I'd bet he picked up the 1991 and worked it like he was back in the corps. Welcome to the Gunnie ranks Jack and Mary Anne! It's interesting to note that Mary Anne had the same reaction to the Ruger Security Six as my wife. She liked it so much that I got it for her birthday present as her first gun. After a thorough cleaning, it's without doubt one of the best shooting 357s I've ever used! if you google 'new shooter' JayG is 5th on the list.